Among many Indian festivals, Ganesh Chaturthi is one of the festivals that has the entire family coming together to seek the blessings of Lord Ganapati. Following the yearly practice of welcoming Bappa with grandeur, this time around, the Kapoors had yet again planned a lavish puja at their residence. 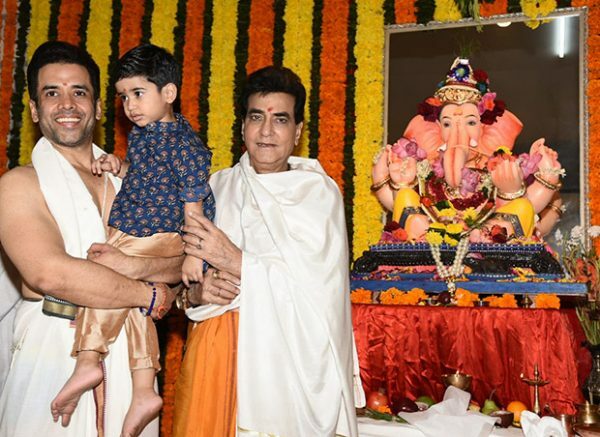 From the looks of it, it seems that Ganesh Chaturthi puja was performed by Tusshar Kapoor, who not only posed with his veteran actor-father Jeetendra but also his son Laksshya Kapoor. Of late, his Instagram posts are filled with shenanigans of his son and how much he adores this phase of his little boy growing up. And the recent posts had him wishing his fans and followers on the special occasion of Ganesh Chaturthi. 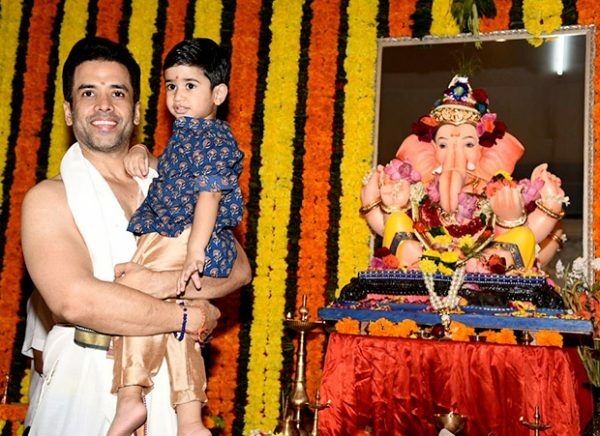 The actor also posted pictures of the celebrations as well as the puja along with giving a sneak peek at the Bappa idol who has arrived at his residence. Tusshar took to social media to share the pictures from the same saying, “#mangalmurtimorya He’s here!!! Back to sort us out and show us the path! #ganpatibappamorya.” Here’s another picture of the actor from the puja. Happy Ganeshotsav to all……may Bappa grant us all the strength & clarity to fight our inner demons and brave the storms! #ganpatibappamorya???? On the work front, Tusshar Kapoor was last seen in Golmaal Again which saw him reuniting with Golmaal stars like Ajay Devgn, Shreyas Talpade, Arshad Warsi and Kunal Kemmu. The film also featured Tabu, Parineeti Chopra and Neil Nitin Mukesh. The Growing Up Gotti Boys -and Their Eyebrows- Are Coming Back!